If you’re an educator, you have probably sat in a school cafeteria (or a library or auditorium) watching a presenter shift powerpoint slides, thinking about all the real work that needs to be done by tomorrow to make sure kids learn. Even with the most enthusiastic, savvy presenter, there’s evidence that the stand and deliver model of professional development falls flat because it fails to truly address the problems of practice teachers confront every day. It’s one size fits all, and increasingly the field is moving toward a model of education that is personalized for students. Well, if we want students to experience personalized, competency based learning, we need to start training teachers in ways that explicitly leverage those approaches. This need for parallel pedagogy is just one of the many reasons why it’s time to rethink professional development. For more reasons, check out 2Rev’s recent chapter on "Unlocking the Future of Learning by Redesigning Educator Learning”. 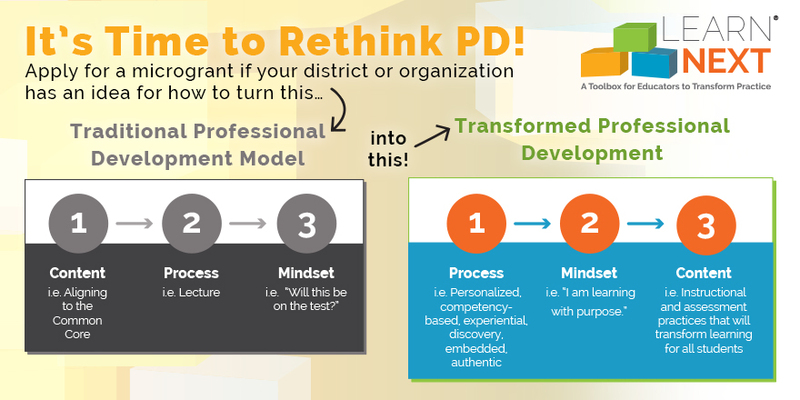 What would it look like if we transformed the traditional “sit and get” professional development model into something much more flexible, engaging, and effective? What if, instead of coming back from a PD day with a packet of handouts that will sit gathering dust on their desk, teachers had the chance to engage in learning they could immediately put into practice? What if teacher development looked more like the authentic, relevant, real world learning we want for students? 2Revolutions and our Learn Next partners are eager to answer those questions and to transform professional development. We know many minds are better than one, so we decided to ask the field for their best ideas to transform professional learning using the Learn Next resources. This fall, we put out a “Request for Learning”, asking schools, districts, and organizations to submit their most innovative ideas for transforming professional learning for the chance to win a targeted micro-grant. The enthusiastic response signaled that there’s a hunger for transformative professional learning. More than 85 schools, districts, PD providers, and states reached out to express interest, and we received more than 50 proposals from across the country. As one of our reviewers, Learning Forward Executive Director Stephanie Hirsh, said, “I think you will have some hard choices to make.” We certainly did. Ultimately, we were able to select a diverse portfolio of innovative grantees. And now, it is our distinct pleasure to announce our grantees! Our grantees include PD providers, school districts, a national nonprofit, and a magnet school -- together serving a diverse array of students from rural, suburban, and urban communities across the country. Each grantee is using an innovative professional learning process and the Learn Next resources to spark transformation in their local context and in the broader field. Teachers don’t always get many opportunities to learn from each other. This medium-sized Tennessee district is supporting professional learning through collaborative innovation cycles. If you want to assess an educator’s strengths and growth areas, why not ask students? This Washington state professional learning provider is surveying students to learn what capacities their teachers need to build, then providing targeted supports to help educators develop those skills. Competencies are designed to prepare students for college, career, and life. This Chicago magnet is transitioning to Competency-Based Education through a teacher-led PD model. We have defined national standards for student learning but not for educator learning. This Brooklyn nonprofit is integrating Learn Next’s framework for teacher learning into a leading LMS that currently focuses just on student standards. If you gave an educator a mic, what would they share? This regional Kentucky PD provider is using an innovative podcasting flipped PD format to elevate excellence and share learning in a dispersed rural school network. What happens when you open up classroom doors to other teachers? This suburban Minnesotan district is using instructional rounds and micro-credentials to drive and assess teacher learning. These grantees will spend this spring and summer implementing their plans to transform professional learning. We’ll share their stories along the way, so stay tuned to learn more! We invite you to follow the #Learn Next and #RethinkPD hashtags on Twitter and sign up for the 2Rev newsletter mailing list. You can also use the free and open Learn Next toolbox of resources grantees will be leveraging to transform professional learning in their contexts. Finally, we’re inviting you to join our free virtual Community of Practice on the InspirED social learning platform where you can collaborate with others working to rethink PD, share problems of practice, and register for webinars with the Learn Next partners during the Winter/Spring of 2019.